What does Malaysia mobile telco; Celcom, Digi and Maxis is offering you to have Internet access while you’re on the move? In Malaysia, Celcom, Digi and Maxis is offering the mobile wireless broadband service with different packages such as data basic plan, data lite plan and data unlimited plan. I will emphasis only on data unlimited plan. The data unlimted plan from these mobile telco is suitable for their high data usage subscribers. It provides total mobility to the subscribers to move around. This is an alternative to wired broadband. The subscribers will not need to worry about the total data usage and time usage. I will emphasis only on EDGE and 3G network. 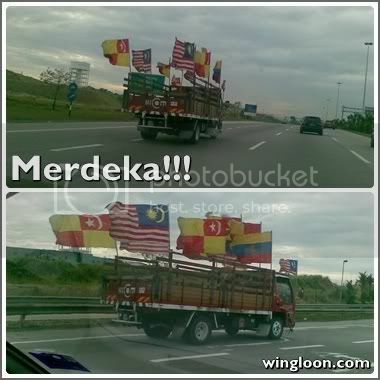 While on the way to my office in Cyberjaya, I stumbled upon a lorry with variety of flags installed. I decided to take two photo shots using my Nokia E61i while I am driving at 40km/h. Malaysians will be celebrating 50 years of Merdeka (Independence Day) on 31 Aug 2007. So, I would like to advise to all my readers not to be neglect on safe guard your own property such as mobile phone. Do not put your mobile phone on the table. No matter on your office table or restaurant table. Please put in your own pocket. Or, attach a lanyard to your mobile phone and hang around your neck. Today, I heard from a lady in my office, she lost her mobile phone while in the pantry. She left her mobile phone in the pantry. After she realized and return to the pantry, the mobile phone is missing. Even a locked notebook is lost too in my office. This people is so desperate…personal headset also got stolen. Beware of your personal wireless USB optical mouse. There was a case happened last week, 2 Indian guys pretending to deliver goods and at the end a mobile phone got stolen. Please read here.